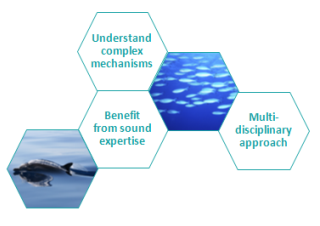 Quiet-Oceans contributes to the understanding of noise impact mechanisms on marine life by participating in collaborative research programmes. This understanding contributes towards developing new strategies, protocols and technologies that allow optimal monitoring and noise impact reduction in relation to marine mammals and invertebrates. – AQUO, european joint research project, 2012-2015 – Aim: to reduce the underwater noise footprint of shipping and thereby better protect marine fauna and flora by putting forth solutions that will influence the design of future naval and civilian ships as well as maritime traffic regulations. Read the press-release. – Industrial chair of excellence Chorus, 2013-2016 – Aim: to conduct research activities that address the future challenges of measuring, interpreting and using underwater acoustic environments: observing marine ecosystems and assessing the impacts of human activities at sea. – Irish project Strive, 2012-2013 – Aim: to characterize the acoustic Environmental Status of Irish waters in compliance with the Marine Strategy Framework Directive (MSFD). Quiet-Oceans’ research, undertaken in partnership with French and international research laboratories, is regularly presented at international conferences. Contact us to find out about work in process and to develop new research programmes.